I couldn’t believe I had such a satisfying weekend. A weekend filled with bun making, kimchi making and trying out new dishes which turned out to be a delight for the family. A memorable day indeed , trying out this chocolate swirl bun. This recipe was taken from a Japanese website. Who would believed that this Momsie is such a daring person, one who doesn’t read Japanese yet dared to use a translating software to translate the ingredients into English and using her amateurish skill to make this delightful bun ! A real treat for the Piggies…the bun turned out fantastically soft and the chocolate swirls , though it doesn’t look nice but it added flavor to the bun. Two thumbs for this delicious bun. 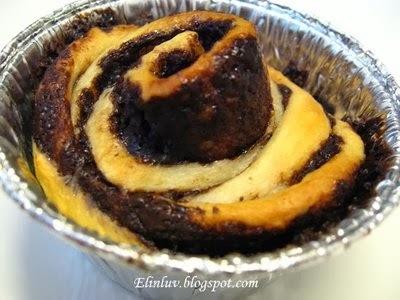 This chocolate swirl bun taken with a cuppa of hot coffee on a rainy or cold night…Mmmm one word…Heavenly ! Put all the ingredients into a mixer and blend into a dough. Take out and knead till it is smooth. Leave to proof for 40-45 minutes. Knock down and roll into a 1/4" thick square piece. 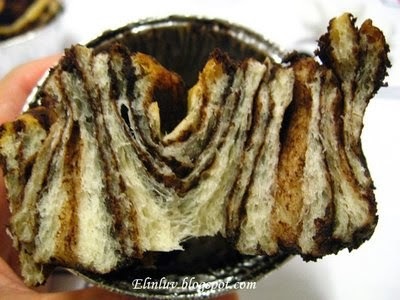 Apply melted chocolate on surface and roll like a rolled cake . Cut into equal portion of 1 1/2" piece and place on aluminium cupcake liner and let it proof for 10-15 minutes. Bake at 200 C for 10-12 minutes or until cooked and evenly brown.